October 7, 2010 - A large-cabin, long-range Gulfstream G450 business jet recently established a city-pair speed record between Savannah and Sao Paulo, completing the 3,922-nautical-mile flight in less than nine hours. 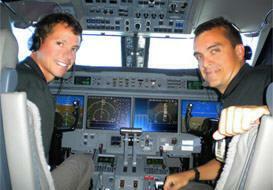 The average cruise speed for the flight was Mach 0.80, with altitudes ranging from 41,000 to 45,000 feet. The G450 took off from the Savannah/Hilton Head International Airport at 8:07 a.m. local time with six passengers, one flight attendant and international captains Eric Parker and Jaime Bahamon on board. The aircraft, flying to the Latin American Business Aviation Conference & Exhibition (LABACE), landed at the Guarulhos International Airport in S?o Paulo eight hours and 50 minutes later. The National Aeronautic Association (NAA) confirmed the flight as a U.S. record and forwarded the figures to the Federation Aeronautique Internationale (FAI) in Switzerland for approval as a world record. The Savannah-Sao Paulo record had previously been unclaimed. Powered by two Rolls-Royce Tay Mk 611-8C engines, the G450 can fly 4,350 nautical miles, Beijing to New Delhi or Moscow nonstop and can reach speeds of up to Mach 0.88. The aircraft features PlaneView, the most advanced flight deck in its class, and the Gulfstream Enhanced Vision System (EVS) as standard equipment. The G450 established its first speed record 10 days after it entered service on May 7, 2005, flying 3,550 nautical miles from Chicago to London in 7:19 at an average speed of Mach 0.85. Since then, the aircraft has set four additional records, including Washington, D.C., to Luton, England 3,290 nautical miles in 6:12; Denver to Honolulu 2,944 nautical miles in 7:07; Oranjestad, Aruba, to Barcelona, Spain 4,374 miles in 8:56; and Tokyo to Hong Kong 1,694 nautical miles in 3:58. Gulfstream Aerospace Corporation, a wholly owned subsidiary of General Dynamics (NYSE: GD), designs, develops, manufactures, markets, services and supports the world?s most technologically advanced business-jet aircraft. Gulfstream has produced some 1,800 aircraft for customers around the world since 1958.